1. The prices are so outrageous it's kind of entertaining. (4.5 room apartment in the middle of nowhere Aargau for SFr 844,000? Oh and that doesn't include a garage...that's an extra SFr 25,000). 2. I can understand most of the text. Come on, really. 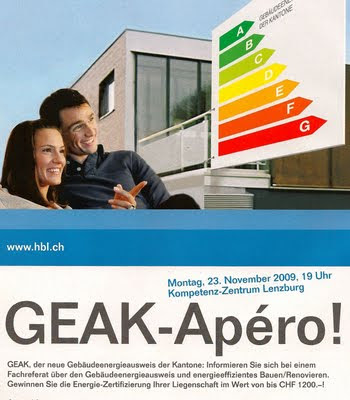 Who can resist a Geak Apero...Not to mention the art direction on this ad really matches my English translation of such a thing. They now have billboards out advertising/promoting Swiss bread. As if they are importing it from other countries & there is competition? Oh Switzerland. Erika, that's a great one. I love foreign ads! Liked this billboards. It is a fashion to keep ads in digital billboards and other services..Outdoor advertising is one of the inspiring thing in today's world..Anyway nice one.. Peoples will surely notice this Swiss butter ads .